The index opened flat and stayed in a narrow range but saw huge dip around noon to the lows of the day at 7661. The responsive buyers took control from thereon to move the index back into the green and closing near the highs of the day at 7751.60, gain of 36.80 points. On a week on week basis the index gained 242.80 points or approx 3.23%. The broader market was also positive, with 875 advances to 677 declines. Broader range for July series comes at 7500-8000. 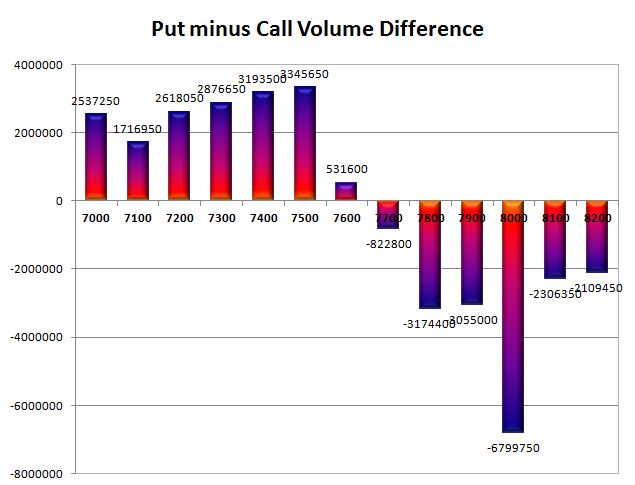 Call option 7800-8200 added 17.99 lacs huge amount of OI with short covering seen at 7600 and below strike prices. Put option 7800-7200 added 11.93 lacs huge amount of OI with small profit booking seen at 7600 strike prices. 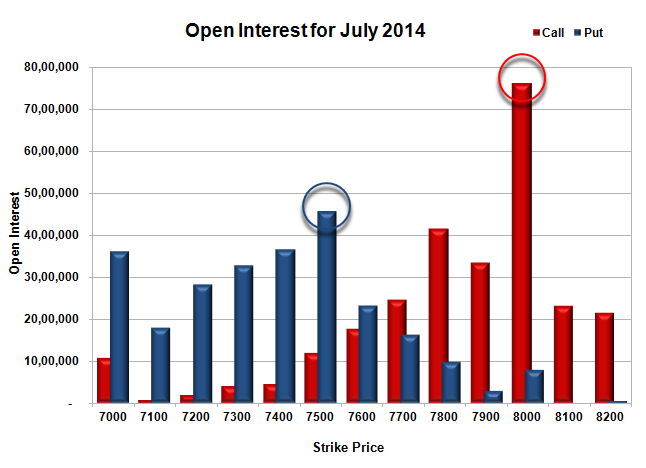 Nifty Open Interest is at 1,42,75,750 down by 77,250, with increase in price, most probably short covering. Bank Nifty Open Interest is at 22,14,550 up by 1,12,275, with increase in price, most probably huge long build-up. FII’s bought 0.71 lacs Futures, mostly short covering as their net OI decreased by 5523 contracts (includes 31746 longs to 30329 shorts for the day) and the average price per contract comes to around 7790.49. FII’s Index future open contract as on date is 199834 Longs to 109007 Shorts. PCR Open Interest (Volume) has moved below 0.9 at 0.891. Initial support at 7700, with huge addition for the day at 2.08 lacs and best at 7500 with OI of 45.57 lacs. 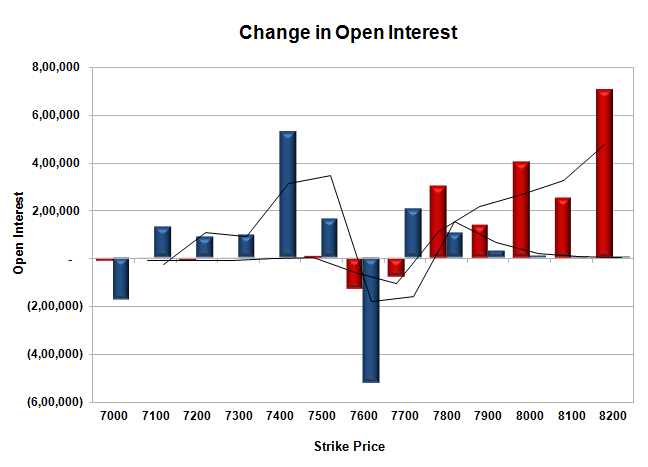 Initial resistance at 7800, with OI of 41.66 lacs and best at 8000 with highest OI of 76.09 lacs. Day Range as per Option Table is 7667 - 7790 and as per VIX is 7678 - 7825 with 7724 as the Pivot.